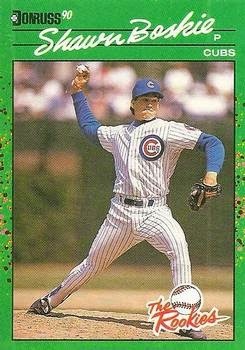 Shawn Boskie pitched nine seasons in the major leagues for the Cubs, Phillies, Mariners, Angels, Orioles and Expos. He won 49 games and struck out 494 batters. Now the Vice President for Institutional Advancement at Arizona Christian University, he kindly answered my questions about baseball cards. - Do you have any stories about cards of yourself or of other players? My favorite cards are signed to me from some of my favorite teammates. These include Jim Abbott, Tony Phillips, Lenny Dykstra, Andre Dawson. I happen to have a card of myself with some NFL football player’s bio and stats on the back. That is funny….I’m sure he’s saying that he has a card of his with some MLB guy’s photo on the other side. - Do you have a favorite card of yourself or of another player? My favorite card is by far and away the Donruss 90 “The Rookies” card. Green border. It is the first MLB card that I ever saw. I knew that I was really in the big leagues when I saw that. - Do you collect baseball cards? Nope. Just a few that mean something to me personally. I have four cards of Paul Blair. This one is from 1978 SSPC. Playing career: Eight-time gold glove winner Paul Blair was one of the greatest defensive outfielders of the 1960s and 1970s, helping the Yankees and Orioles to six pennants in his seventeen-year career. A two-time AL All Star, he appeared to have a breakout season in 1969, hitting .285 with 26 HR, 76 RBI and 20 SBs. However, he was hit in the face with a pitch the following season and was never the same as a hitter, though he was still a competent bat for many years. Overall, in 1,947 major league games he hit .250 with 134 HR, 620 RBI and 171 SB. Post-playing career: Blair was a long-time coach at both the college and minor league level. He died of a heart attack at a celebrity bowling tournament in 2013. My memories: He was from before my time, though I read a lot about him as a key bench player on the great Yankee teams of the late 1970s. Google Autocomplete results: He is fourth when you type Paul Bl, between Paul Blackthorne, an actor, and Paul Bloom, a Yale psychology professor. Another prominent Paul Blair is a DJ for Lady Gaga. Coming up next: The next profile will be Willie Blair. I have one card of Dennis Blair, from 1978 Topps. Playing career: Dennis Blair pitched for the Expos from 1974 to 1976. In 57 games he went 19-25 with a 3.69 ERA. He was traded to the Orioles but never pitched for the big league club (making this a “zero-year” card - Nick this is going in your trade package!). He did resurface with the Padres for five games in 1980. A fuller account of his career can be found at Smed’s Baseball Card Blog. Where he is now: Anyone know where Dennis Blair is now? Interesting facts: His cousin Bill Blair is the former head coach of the Minnesota Timberwolves. Google Autocomplete results: He is third when you type Dennis Bl, between Dennis Block Greenberg, referring to a famous corporate attorney and his law firm, and Dennis Bligen, a former running back for the New York Jets. There are no mentions of the ballplayer on the first page of results; most refer to the former US Director of National Intelligence. Coming up next: The next profile will be Paul Blair. I have one card of Carson Blair, from 2010 Bowman Prospects. Playing career: Catcher Carson Blair was drafted by the Red Sox in the 35th round in 2008. He is still in their organization though he hasn’t played above A ball. In 218 games he has hit .216 with 18 HR and 100 RBI. Where he is now: He is in his third season at Class-A Salem. In 29 games he is hitting .167 with 4 HR and 20 RBI. Google Autocomplete results: He is eighth when you type Carson Bl, between Carson Block NQ and Carson Block Bloomberg, both of which refer to a stock market expert. There do not appear to be any other prominent Carson Blairs. Coming up next: The next profile will be Dennis Blair. I have two cards of Ian Bladergroen. This one is from 2005 Topps. Playing career: First baseman Ian Bladergroen played five seasons in the Mets, Red Sox and Mariners organizations, never getting above A ball. In 428 games he hit .272 with 44 HR and 258 RBI. A fuller account of his career can be found at Smed’s Baseball Card Blog. Where he is now: A firefighter in the Savannah, GA fire department and assistant varsity baseball coach at Richmond Hill High School. Google Autocomplete results: He is second when you type Ian Blad, between Ian Blades, Managing Consultant at Vertical Appointments, and Ian Bladen, Voice Operations Manager at Citi. There do not appear to be any other prominent Ian Bladergroens. Coming up next: The next profile will be Carson Blair. I have ten cards of Tim Blackwell. This one is from 1981 Fleer. Playing career: Backup catcher Tim Blackwell played for the Red Sox, Phillies, Expos and Cubs from 1974 to 1983. Known as an excellent defensive backstop, in 426 games he hit .228 with 6 HR and 80 RBI. His best season by far was 1980, when he hit .272 with 5 HR and 30 RBI in 103 games. A fuller account of his career can be found at the 1980 Topps blog. Where he is now: He was a long-time minor league coach but is now retired. Google Autocomplete results: He is third when you type Tim Blac, between Tim Black, a pro basketball player in Europe, and Tim Blackburn, Director of the Zoological Society of London. Another prominent Tim Blackwell is a digital musician. Coming up next: The next profile will be Ian Bladergroen. I have one card of Larry Blackwell, from 1989 Best. Playing career: Outfielder Larry Blackwell played six years in the Twins organization, reaching as high as AA. Blackwell claims that Twins manager Tom Kelly promised him that he would put Blackwell in center field and move Kirby Puckett, but he then got hurt. He also claims that after he was released the Twins blackballed him so that he could not catch on with another team. However, considering that he never played above AA ball, and when he did, he put up decidedly mediocre numbers (.232, 6 HR and 52 RBI in 158 games) it seems more likely that Blackwell’s opinion of himself was a lot higher than anyone else’s. I’m guessing that the conversation with Tom Kelly was probably greatly misunderstood by Blackwell. You can read more about him on the Signed DC blog. Where he is now: He worked as a corrections officer and a youth prison supervisor before getting his college degree and becoming a social worker. Google Autocomplete results: He is eighth when you type Larry Blac, between Larry Blackmon NYC Parks, referring to the Deputy Commissioner for Community Outreach, and Larry Black Centore, a Florida gangster arrested in the 1980s. There are no references to the ballplayer on the first page of Google results; the first is for the founder of Datastream. Coming up next: The next profile will be Tim Blackwell. I have one card of Chad Blackwell, from 2004 SP Prospects. Playing career: Chad Blackwell pitched in the Royals, Pirates, Blue Jays and Angels organizations from 2004 to 2009. In 165 games, all in relief, he went 17-16 with 25 saves and a 3.77 ERA. Where he is now: Anyone know where Chad Blackwell is now? Google Autocomplete results: He is fourth when you type Chad Bl, between Chad Blocker, a partner at Fragomen Del Rey in Los Angeles, and Chad Bluebear Geary, who appeared in the reality show “American Hot Rod”. Another prominent Chad Blackwell is a famous trucker. Coming up next: The next profile will be Larry Blackwell. Baseball card bloggers come from a lot of different professions. There are a few teachers, some IT administrators, some musicians, etc. The most prominent active bloggers are a college student and a guy with some kind of late-night job at a newspaper. One of the most unique bloggers is Tony L. of the 1982 Topps Blog, who is a successful corporate lawyer at one of the world's largest and most prominent law firms. I work with a lot of people like him in my own job, and one thing I know about corporate lawyers is that they write really well. Tony is no exception, and if you haven't checked out his blog yet, it is arguably the best of the "set blogs" out there, with each post both comprehensive and entertaining. Tony was kind enough to send some cards my way after I helped him with one of his posts. Here is what he sent me, knocking off some wants from 1992 Donruss Triple Play. I have one card of Charlie Blackmon, from 2011 Topps Update. Playing career: Outfielder Charlie Blackmon came up with the Rockies in 2011. He steadily improved each season, and by 2013 he hit well enough (.309, 6 HR, 22 RBI in 82 games) that the Rockies traded Dexter Fowler after the season so Blackmon could be the full-time center fielder. Where he is now: He went six-for-six on Opening Day, tying a Rockies record, and hasn’t stopped hitting since. In 45 games this season he is hitting .335 with 9 HR and 32 RBI. Yesterday he was 1-4 in a loss to the Giants. My memories: Only know him from his card. Have been too busy to follow much baseball outside of the Yankees this year so was unaware of his fast start. Google Autocomplete results: He is first when you type Charlie Bl, ahead of Charlie Bloods Garfield, a restaurant in a New Jersey town. There do not appear to be any other prominent Charlie Blackmons. Coming up next: The next profile will be Chad Blackwell. I have three cards of Travis Blackley. This one is from 2004 Cracker Jack. Playing career: Travis Blackley pitched for the Mariners, Giants, A’s, Astros and Rangers from 2004 to 2013. In 82 games he went 9-9 with a 5.23 ERA. Where he is now: Pitching in Japan. Google Autocomplete results: He is first when you type Travis Bl, ahead of Travis Bland, a model. There do not appear to be any other prominent Travis Blackleys. Coming up next: The next profile will be Charlie Blackmon. I have four cards of Nick Blackburn. This one is from 2012 Topps. Playing career: Nick Blackburn has had the typical career of a good-control, pitch-to-contact hitter – a lot of hits allowed, not a lot of strikeouts or walks. These kind of pitchers usually have some initial success that is not sustainable once the league figures them out. In 2008 and 2009 he put up decent (and almost identical) numbers – 11-11, 4.03 and 1-11, 4.05. In 2010-2012 he pitched much worse (21-30, 4.63) and has not pitched since due to injuries. My memories: I remember him vaguely with the Twins (I see he pitched against the Yankees in the 2009 ALDS) but nothing specific. Where he is now: Currently rehabbing a knee injury but hopes to sign with a team later in 2014. Google Autocomplete results: He is fourth when you type Nick Bl, between Nick Bloom, an economics professor at Stanford, and Nick Blinko, a British musician. Another prominent Nick Blackburn pitches for the University of Illinois. Coming up next: The next profile will be Travis Blackley. I have 67 cards of Bud Black. This one is from 1983 Topps. Playing career: Bud Black pitched for fifteen years in the major leagues, mostly for the Royals and Giants. In 398 games he went 121-116 with a 3.84 ERA. He was used as both a starter and a reliever with success by the Royals, helping them win the World Series in 1985. He was less successful as a full-time starter with Cleveland and San Francisco. My memories: I remember him mostly as a high-profile free-agent bust for the Giants. He signed a four-year deal with them after the 1990 season, then led the NL in losses. Where he is now: He is in his eighth season managing the San Diego Padres. He made a good first impression, leading them to an 89-74 record in 2007. Since then he has had sub-.500 records five of the last six seasons, but his job seems secure in relaxed, not-baseball-mad, San Diego. If you make a good first impression, you get a lot longer leash. This year they are off to another sub-.500 season, currently 21-24 after yesterday's loss to Colorado. Google Autocomplete results: He is third when you type Bud B, between Bud Bowl, the old Super Bowl commercials for Budweiser, and Bud Butter, a cookbook for stoners. Another prominent Bud Black pitched for the Tigers in the 1950s. Coming up next: The next profile will be Nick Blackburn. I have one card of Brian Bixler, from 2008 SP Authentic Rookie Exclusives. Playing career: Utilityman Brian Bixler spent parts of four seasons in the major leagues with the Pirates, Nationals and Astros between 2008 and 2012. In 183 games he hit .189 with 2 HR and 14 RBI. Where he is now: Signed with the Padres for 2014. In 21 games at AA San Antonio, he is hitting .107 with 1 HR and 4 RBI. Google Autocomplete results: He is first when you type Brian Bix, ahead of Brian Bix, a professor at the University of Minnesota Law School. Another prominent Brian Bixler is an orthopedist in York, PA.
Coming up next: The next profile will be Bud Black. I have one card of Matt Albers, from 2012 Topps Update Set. Playing career: Matt Albers came up with the Astros in 2006, and has pitched in 364 games, mostly in relief, for five different teams – Houston, Baltimore, Boston, Arizona and Cleveland. He is 25-31 with a 4.42 ERA for his career. Where he is now: He is back with the Astros in 2014. In eight games he has allowed one earned run in ten innings but is currently on the disabled list. Google Autocomplete results: He is tenth when you type Matt Alb, behind Matt Albie, a TV character. There do not appear to be any other prominent Matt Alberses. Coming up next: The next profile will be Brian Bixler. I have one card of Tyler Austin, from 2012 Bowman Prospects. Playing career: Outfielder Tyler Austin was drafted by the Yankees in 2010 and has worked his way up through their system. After a very successful 2012 season at two Class A teams, he struggled at AA Trenton in 2013. Where he is now: He is at AA Trenton again in 2014 and continues to struggle: in nineteen games he is hitting .247 with 0 HR and 6 RBI. Interesting facts: He was diagnosed with testicular cancer at the age of 17. He had surgery and has been cancer-free ever since. Google Autocomplete results: He is first when you type Tyler A, ahead of Tyler Ancrum, a high school basketball star in Connecticut. There do not appear to be any other prominent Tyler Austins. I have one card of George Bjorkman, from 1984 Topps. Playing career: Catcher George Bjorkman played for the Astros in 1983. In 29 games he hit .227 with 2 HR and 14 RBI. Where he is now: Now a technical manager at Hewlett-Packard in Plano, TX. Google Autocomplete results: He is first when you type George Bj, ahead of George Bjorkland, an artist. There do not appear to be any other prominent George Bjorkmans. Picked up a big haul of cards, almost all from 2007 and 2008. Lots of duplicates to trade including two complete sets. In the box were two complete sets each of 2007 UD Future Stars and of 2008 UD Masterpieces. I am keeping one of each, so I have one of each up for trade. There were also a ton of additional singles from these sets, especially Masterpieces, so if you have individual wants for these sets let me know. There was also a complete 2007 UD Masterpieces set, but not a second one. I do have a few singles from that one to trade. Also lots of duplicate singles from this set (and its companion "Rookie Exclusives" set) to trade. Again, plenty of singles to trade from this set so let me know your wants. While I previously had a few gold foil variations of cards in this set, there were a lot of cards which had a holographic-rainbow foil variation. There were quite a few miscellaneous cards in the box as well, including lots of cards of players like A-Rod and Dice-K who were the big names to collect in 2007. The coolest of these cards was a Garrett Atkins jersey card with a nice pinstripe swatch. There is no blogger more generous than David from Tribecards, who does an awesome and extensive giveaway every season. I got my big box yesterday and the contents were terrific! I managed to get an autographed card, which is very cool. Aaron Thompson pitched in the major leagues for the Pirates in 2011, and is currently in the Twins organization. Great shot of Ben Sheets and what is presumably his son Seaver. Hard to tell in the photo but this is a really awesome double-hologram card of Jim Edmonds. I had never gotten one of these cards before - a 1981 Topps Scratch-off card. The 1994 Topps factory sets came with special preview cards of their premier lines. When I bought a factory set last year I got Bobby Bonilla (ugh). Jack McDowell is a whole lot cooler one to get. I don't have any 2014 cards yet (the Topps cards look OK, but I really like the look of the Donrusses I have seen on other blogs). In fact, the ten 2013 base cards I got more than doubled my collection of last year's set. A cool thing of doing the collection by player is getting different variations of the same card, as happened here with Marco Scutaro. I have five cards of Jeff Bittiger. This one is from 1989 Upper Deck. Playing career: Jeff Bittiger pitched for the Phillies in 1986, the Twins in 1987, and the White Sox in 1988 and 1989. In 33 games he went 4-6 with a 4.77 ERA. A fuller account of his career can be found at The Greatest 21 Days. Where he is now: An Oakland A’s scout and an instructor at the Lehigh Valley Baseball Academy. Google Autocomplete results: He is second when you type Jeff Bit, between Jeff Bitsack, a director, and Jeff Bitsimis, a realtor. There do not appear to be any other prominent Jeff Bittigers. Coming up next: The next profile will be George Bjorkman. I have four cards of Joe Bitker. This one is from 1990 Donruss. Playing career: Joe Bitker pitched for the A’s and Rangers in 1990 and 1991. In fifteen games he went 1-0 with a 4.73 ERA. A fuller account of his career can be found at The Greatest 21 Days. Where he is now: An instructor at Evolution Baseball in Chico, CA. Google Autocomplete results: He is the only entry when you type Joe Bitk. There do not appear to be any other prominent Joe Bitkers. Coming up next: The next profile will be Jeff Bittiger. I have one card of James Bishop, from 1992 Classic Best. Playing career: Third baseman James Bishop spent eleven years in the Blue Jays, Indians, Reds, Brewers and White Sox organizations. In 1031 games he hit .260 with 75 HR and 482 RBI. Where he is now: He is very active in urban youth baseball instruction in Los Angeles with the MLB Urban Youth Academy, where he is Facilities Manager, and The Baseball Legends, Cecil Fielder’s organization, where he is an instructor. Google Autocomplete results: He is third when you type James Bis, between James Bishop Artist, referring to an American painter living in Paris, and James Bistis, President of Core Services in Somerset, NJ. There are no references to the ballplayer on the first page of google results; the first entry refers to a New Jersey congressman from 1855-1857 who was a member of the Opposition Party, a moderate third party that descended from the Whigs. Coming up next: The next profile will be Joe Bitker. I have one card of Joseph Bisenius, from 2007 Ultra. Playing career: Joseph Bisenius has pitched professionally since 2004, and made the major leagues twice – with the Phillies in 2007 and the Nationals in 2010. In seven major league games he went 0-0 with a 6.43 ERA, striking out eight batters in seven innings. Where he is now: Will pitch for the independent Lincoln Saltdogs in 2014. Google Autocomplete results: He is the only entry when you type Joseph Biseni. There do not appear to be any other prominent Joseph Biseniuses. Coming up next: The next profile will be James Bishop. I have sixteen cards of Tim Birtsas. This one is from 1985 Fleer Update. Playing career: Tim Birtsas pitched five seasons in the major leagues for the A’s and the Reds. In 138 games he went 14-14 with a 4.08 ERA. Where he is now: During his playing career, which took him across the US as well as to Japan and Italy, Birtsas would take pictures and notes about the architectural styles and places around him. After his playing career ended Birtsas founded RBI Construction Management with former major leaguer Kirk Gibson, who Birtsas knew since high school; in fact, Birtsas’s mother and Gibson’s father worked in the same school district in Michigan. Among their projects were buying a historic barn which they then donated to Oakland County, MI, and the Olde Mill Inn, a lakefront hotel which Birtsas still runs. In 2009, Birtsas, a Republican ran for Springfield Town Clerk, but lost to another Republican who had been endorsed by the retiring incumbent. My memories: Birtsas was a Yankee minor leaguer who was one of several prospects the team traded to Oakland for Rickey Henderson. I always thought of him as one of the many young pitchers the Yankees got rid of who went on to success elsewhere, though looking back at his career now it looks like the Yankees didn’t lose out on much in this case. Google Autocomplete results: He is seventh when you type Tim Bir, between Tim Bird IMDB, referring to an assistant director, and Tim Birkmeier, mortgage broker. There do not appear to be any other prominent Tim Birtsases. Coming up next: The next profile will be Joseph Bisenius.